Beverly J. Layman, professor emeritus of English, died on Sept. 13, 2017, a week shy of his 98th birthday. At the time of his death, Bev had been living with his beloved wife, Marnye, in Harpers Ferry, W.Va., close to the home that they shared for the 30 years following his retirement from Wellesley in 1984. 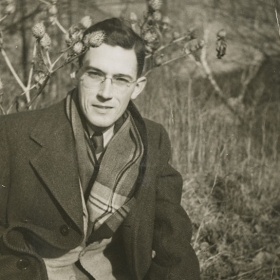 Beverly J. Layman, professor emeritus of English, died on Sept. 13, 2017, a week shy of his 98th birthday. At the time of his death, Bev had been living with his beloved wife, Marnye, in an assisted-living facility in Harpers Ferry, W.Va., close to the home that they shared for the 30 years following his retirement from Wellesley in 1984. Marnye died on Dec. 11, 2017. Bev and Marnye met as high-school students in Roanoke, Va., and those of us who had the good fortune to be Bev’s colleagues remember well his courtly devotion to her and his happy anticipation of the years that they would spend together in a home they were designing on property that had long been in Marnye’s family. I remember in particular Bev’s excitement about the openness of the design to its natural surroundings and about the spaces that it would provide for Marnye to continue her work as an artist. They are survived by their three children, Richard Layman, Judith Layman, and Margaret Layman Shapiro ’77. By all accounts, especially Bev’s own, their years together in Harpers Ferry happily fulfilled, even exceeded, his expectations. In an email of 2001, he wrote me of “A fine morning, sunny, unhumid, and cool enough for Marnye and me to breakfast on the deck and give thanks that unlike Ruskin’s Venetians we are not ‘shut out from the sweet wonders and charities of the earth, and from the pleasant natural history of the year.’ Our two-acre yard is rimmed round by a now tropical abundance of wine berries, catnip, poison ivy, rosa multiflora, rampant wild grape, and other vines climbing all over ailanthuses and box elders (‘weed trees’) and threatening even oaks and elms. Our troops of friends are feathered every one, and this morning we are teased by a song we can’t identify.” Everything about this description was characteristic of Bev—its elegance, its detailed attentiveness, the unrueful registration of a shared solitude with Marnye, the ready resort to experience-heightening quotation from a favorite writer. And also the demotic directness with which he named those “weed trees” and went on to note the “horrible stink” that a contrary breeze sometimes sent to them from a neighboring pig farm. In other letters and reports, there was ample evidence that Bev continued in his retirement to read widely in his favorite writers and favorite art books, bringing to them the same intensity and scrupulosity of attention that his colleagues remember from his years as a teacher and a valued member, twice the chair, of the English department. If you served on a search committee with Bev—he ran many of them during his six years as chair—you quickly grew to rely on the penciled marginalia in which he noted a candidate’s weaknesses in grammar or argument, or corrected typos or errors of dating in notes and bibliographies. And you relished as well his warmly positive judgments, as he noted with the same fine hand the precise character of an achieved argument or a point well made. The art and literature of the Renaissance were Bev’s well-loved specialties, but his tastes were catholic, his learning was wide and deep, and he attended to everything with a discriminating intensity that he could then convert into sentences of rare power and precision. He was meticulous, but never dry; deceptively mild, even recessive at times, but always warmed by a banked intensity of emotion that could flash out memorably. Could and did, in his teaching, his conversation, and his writing. Whether he was talking about the great jazz cornetist, Bix Beiderbecke, or a favorite art critic, remembering a beloved friend, popping the bubble of an inflated reputation, or writing about the supreme achievements of one of the many writers he knew so well, Bev’s language was alive with intelligence and feeling and with vividly exact phrases and formulations. He was an exceptional person, and he is remembered.